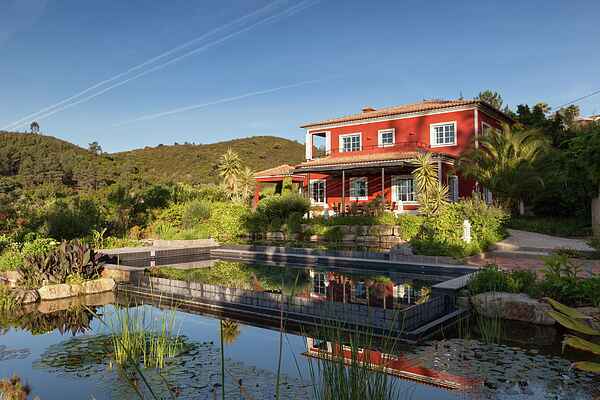 The spacious and stylishly decorated holiday Villa Ribeira do Banho breathes an atmosphere of peace. The Villa has 7 bedrooms and is suitable for max. 14 persons. Through the hall you enter the spacious, stylishly designed living room with sitting areas and a fireplace. Adjacent is a spacious dining room with large dining table for 14 persons. Modern fully fitted kitchen with all modern conveniences. Claokroom and stairs to the first floor in the main hall on the ground floor. Ground floor with four bedrooms each with with two comfortable single beds and each bedroom has a private bathroom, 2 with shower and 2 with bath. On the 1st floor there are three bedrooms each with two comfortable single beds and private bathrooms (1 with bath, 2 with shower). There is also a 2nd living room with kitchenette, fitted with all modern conveniences. Through folding doors you can reach a large sun terrace. The main terrace has a large dining table and barbecue and is a perfect place to enjoy a lunch or diner. From this terrace you can enjoy a wonderful view of the green hills and the ocean. The luxurious, unique swimming pool (5 x 10 meter) with saltwater system is perfect place to relax and is surrounded by ponds The Villa Ribeira do Banho offers wireless internet, 2 satellite TVs, video, DVD player, radio, CD player, underfloor heating (optional) and child’s beds (on request). A pantry with washing machine, dryer and ironing facilities is situated next to the terraces.